Sometimes I have crazy ideas. Okay, maybe a little more often than sometimes. If you’re a regular reader, you know what I mean. Well, my latest idea–actually, I’ve thought about this one for years–involves renting an empty storefront. I would paint a simple sign in the window: NIHIL. I would set up a desk with a computer where I could write. I would also surround myself with my books in bookcases. There would be inviting desks, tables, and sofas for for the curious to come in and be creative. Or, if they’re not creative, reading would also be permissable. If no one came in, I would sit there in public view writing my blog or working on my website. Anyone would be welcome to come as long as no one talks and interrupts the creative process of anyone present. For the uninitiated who entered and asked, “What does ‘Nihil’ mean?” I would say, “Nothing.” Or perhaps I would say nothing. And maybe they would catch on that they were not supposed to talk. I would point at the available furniture. If they left, so much the better. This way I could keep writing. If, however, they stayed quietly, I would feel as if I had accomplished something. This is a crazy idea for me because I basically do that at home right now. Whenever I’m at home I sit at my computer writing something or other without any interruptions. Or, I read. Some people can’t do anything productive at home, but not me. I’ve always been at my most productive while at home! Besides, I can’t afford to rent an empty storefront. Reading has been my lifelong passion. I have always loved reading! Even when I went camping with my friend Jim, I took books along. He took a picture of me reading while I so engrossed in whatever book it was I was reading. I loved the first grade when we started reading. At that level, it didn’t matter that I didn’t know English. Our homework involved reading to our parents at home. My mother thought that was too much trouble for her after a long day’s work, so I would read to my abuelita. Unfortunately, not only did she not speak English, but she was also blind. But she loved when I read to her. And I was grateful to have someone to listen to me read. When I was a little older, I used to go to the library to read. I mostly read joke and riddle books, but that still counts as reading in my book. In the seventh grade, Divine Heart Seminary let me check out books from their library via the USPS. I only remember two of the books that I read. One book was about Father Damien who was a missionary on a leper island in Hawaii. And the other one was Fighting Father Duffy who was a U.S. Army chaplain during World War II. Now would a seminary only send me books about priests? I’ve always wondered about that. I like reading at the library because I had more privacy. If mother saw me reading comic books or even books, she would criticize me for be lazy. When I finally bought my first car, I would drive to Marquette Park just to read in my car. When I would come home, my mother would ask me what I did. When I told her I went to the park to read, her blood would boil. Then she would tell about other constructive things I could have been doing around the house. In general, the uneducated masses don’t understand why anyone would want to read a book. When I worked in the peanut butter factory, I always carried a paperback in my back pocket. Whenever the production line stopped or I was on break or lunch, I would pull out my book and start reading, even if I had to stand. No matter who my boss was, he would come by and tell me to pick up a broom and start cleaning up my area. No one at the factory really understood why I liked reading so much. Ironically, the books I chose to read were the books that I refused to read in high school. In high school, I spent most of my time reading chess books. For two years my life revolved around chess. But once the books weren’t required reading, they piqued my curiosity. Why were they required reading in the first place? So, one by one, I read all the books I once rebelled against. Suddenly, I felt a certain sense of fulfillment. In the Marines, I bought the Great Books set and I would read them every free moment. My fellow Marines thought I was a bit crazy, but maybe that’s why no one started any trouble with me. That and I told everyone I knew kung fu. No one wanted to risk starting trouble with me. The audio book I borrowed from the Chicago Public Library. I just finished reading this great book about Chicago and the 1893 Columbian Exposition. And when I say reading, I mean “reading” as in I didn’t actually read the book. Rather, I listened to the audio version of it on CDs while I drove. So I’ve been doing a lot more “reading” lately because I’ve been doing a lot more driving (no quotes) lately. And that’s all thanks to these audio books on CD. For some reason, I didn’t like listening to audio books on cassette and I only listened to a few. Cassettes just seemed like to much work. For a while, I wasn’t reading as much because I was always on the go. But now I can do both at the same time! I love audio books on CD! I had heard about this book years ago and I had always meant to get around to read it, but somehow I never had time. A few weeks ago, I was in my local library and I saw this book prominently displayed on the shelf. I love reading books about Chicago! 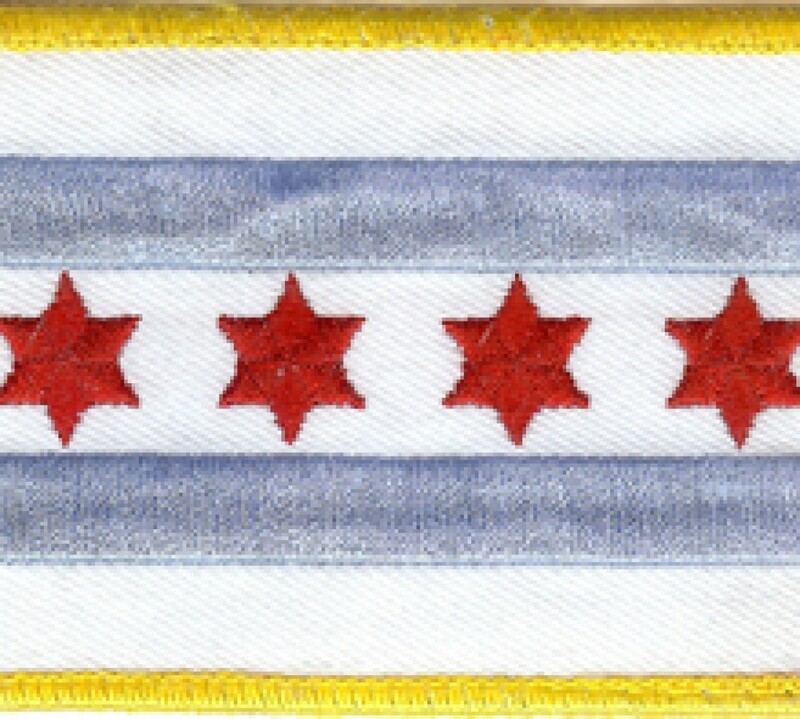 This book focuses on the Chicago World’s Fair of 1893, which is represented by one of the red stars of the Chicago flag below. (Note to self: Write a blog entry about the symbols of the Chicago flag.) I learned so much about Chicago history through this one book alone. First modern serial killer was H.H. Holmes who got his start during the World’s Fair. CD Book from the Chicago Public Library. For someone who spends so much time on the Internet, I also spend a lot of time on the road. Since I’m on the road a lot, I feel like I’m wasting time I’m not on the Internet. True, I occasionally check my e-mail on my iPhone while I’m driving and I do study road maps while on the Internet. The best of both worlds! Years ago, I tried listening to books while driving. That was back when most of them were on cassettes. I quickly gave up because it involved too much work. So lately, I once again felt the need to occupy myself productively while driving. While studying Russian, I listened to the oral activities on an mp3 player via my car radio. But it just wasn’t the same as reading. I remembered the audio books. Most books are on CDs now and are much easier to manage while driving. The first one I heard was On the Road by Jack Kerouac. Because I imagined writing a blog entry, titled “On the road”! I also listened to Heart of Darkness by Joseph Conrad, but decided against writing a blog entry titled, “On the River Niger”! How would that be possible while driving my 2005 Pontiac Vibe? I went to the library to check out their collection of audio books. I immediately gravitated toward Jack Kerouac because On the Road has been on my “To Read” list since the 1980s. I have always heard about that book and any book that constantly attracts my attention deserves to be read–at least in my book. I had no idea what it was about, but I knew I just had to read it. I was intrigued by the fact that it was written on one continuous sheet of paper. I tried to imagined how Kerouac could have written his book lugging his manual typewriter and roll of paper while driving all over the country. To think that I complain whenever I have to lug my laptop computer around with me! Anyway, the book was an interesting read because I was disappointed by its plot, but enticed enough by the writing style to continue listening to the end. The reader of the audio book made it very interesting in the way he acted out some of the scenes. He added so much to text. If I were reading the actual book, I would have finished reading it because it did captivate me in a way I had not expected. Kerouac has this enormous vocabulary that occasionally upstaged the action of the novel. For instance–however, I don’t recall all the details nor the exact wording–in one scene Kerouac and his friends find themselves released from jail after a night of heavy drinking, carousing and fist-fighting. They have no money and they don’t know where their car is. Jack says, “whereupon we pondered our dilemma.” Somehow, the high diction added to the incongruity of their situation. Of course, I would never associate with such friends for very long, which is why I never wrote my own On the Road. When I was in high school, I inherited a manual Underwood typewriter that was in the attic where my new bedroom was located. Since I was little, I wanted to be a writer, so this was my perfect opportunity. I spent a lot of time in my unfinished-attic bedroom typing away on that typewriter. I also found a roll of paper and inserted it into my typewriter. This was before I even heard of Jack Kerouac! Now I wouldn’t have to stop writing to insert a new sheet of paper! I can’t say what I wrote was very interesting since I spent most of my waking hours cooped up in that attic. I don’t know what ever happened to my manuscript(s) (Depending on how you count everything I wrote on the scroll), or if anything I wrote was very good. But I enjoyed my time as a writer, living in squalor in an unfinished attic, living the Bohemian lifestyle. Minus the Kerouac road trip and alcohol. Stuff White People Like on my iPhone. I started reading the blog Stuff White People Like about two months after it started up. I think I read about it on the Internet somewhere and I checked it out. I really enjoyed reading it and found myself laughing out loud many times. Then, one day, I thought, “I could write for this blog.” So, I contacted Christian Lander and asked him if he accepted freelance submissions. He said that he would, but that he had just signed a book deal and they didn’t want a lot of other new writers now. I understood perfectly. But for some strange reason, I had really, really wanted to write one post for the Stuff White People Like. I tossed around several ideas in my head during my idle moments–of which I seem to have more and more with each passing day. But I never actually wrote anything down, as I am wont to do. Soon the blog announced the forthcoming publication of the Stuff White People Like book and there was much excitement in the blog’s comments. I commented that I wouldn’t buy the book since I had already read all the posts and comments on the Internet for free. As it turned out, the book version had several new never-before-read entries. However, I still refused to buy the book and ended up reading it for free at Borders in two visits! The dream job for the English major. Whenever a college student announces that he or she is an English major, be sure to state, “But you already know English!” This will reaffirm his or her belief that no understands the value of a great liberal arts program. When speaking to an English major, whether a current student or a proud graduate, always comment on how well they speak English and how flawless their grammar is. Also mention the decline of the English language since the Elizabethan Era. Many English majors have learned some very funny jokes while enduring long, boring seminars on Chaucer and the Romance of the Rose. They will even share these jokes with you if you let your guard down. English majors are proud of the fact that they are English speakers. When engaging in a conversation with an English major, be sure to nod in agreement but never interrupt. There is no need to start an argument with an English major. Oftentimes, he or she will start one without your assistance. For example, the conversation may suddenly turn to The Wasteland, and without your aid, he or she will begin arguing whether T.S. Eliot was American or British. Be sure not to get involved in the argument. You will not win. If you would like to change the subject of the argument, simply mention how you always felt that the Nobel Committee screwed James Joyce. When I moved from Marquette Park to Bridgeport, I really missed having a bookstore a mere block away. Bridgeport had the reputation of being the center of city politics, rather than being an incubator of intelligence. So, needless to say, Bridgeport had no bookstores at all! Even their Salvation Army lacked a book section! One day in the early 1990s, I was shocked when I saw an empty storefront on the 3100 block of South Halsted Street open as Modern Bookstore. For a neighborhood bookstore, it was very big. I was there the very first day it opened. The woman who greeted me let me browse for a while. I wasn’t sure what to expect from this bookstore, especially for one in the heart of Bridgeport. Imagine my surprise when I saw that most of the books were about socialism, communism, and labor unions. The woman asked me if she could help me find something. I asked to see the fiction section, but there was none. Then, even though I was sure that she would say no, I asked if they had a foreign language section. I told her I was interested in buying books in Spanish. Would you believe it? They did have a Spanish section that was actually bigger than most of the others in Chicago bookstores I had visited. And they actually had books by authors and biographies of political figures that I had actually heard of. I bought a poetry anthology by Nicolás Guillén. Later, when I read the book, I discovered that the book was published in La Habana, Cuba, and probably shipped to the U.S. violating at least one embargo law. But wait, I also bought biographies about Diego Rivera, Benito Juarez, Benardo O’Higgins, and a few others that were written in Spanish. Much later, I realized that the books were written by Russian writers and later translated into Spanish. All these books were published in Moscow, Russia. I wondered if there would be any trouble if our local politicians had actually visited the Modern Bookstore and realized what kind of books the bookstore was selling there. But then I realized that’s why there wasn’t bookstore in Bridgeport in the first place. No one in Bridgeport reads! I remember when my abuelita came to live with us in Chicago back in the 1960s. I liked having my grandmother living with us because she used to take care of me when both my parents went to work. She even protected me from my mother when she hit me a little too hard or a little too long. I remember once for homework in the first grade I was supposed to read aloud from our reader to one of my parents. My father wasn’t home, so I went to my mother. She said she was too tired from work to help me do my homework. I told her that all she had to do was listen to me read. The reader was quite simple: “See David. See Ann.” And so on. I didn’t even know that much English at the time. Anyway, my mother didn’t want to be bothered by me. I kept begging her to listen to me. Finally, my abuelita said that I should read to her. I wasn’t sure if she could help me to read this book. At first, I hesitated because not only did she not know English, but she was also blind. One of the reasons she came to Chicago was to get eye surgery. I remember we would all go to Cook County Hospital and wait for hours until the doctor finally saw her. After her surgery, she no longer had her eyes. I remember my parents struggling to put her glass eyes into her eye sockets and my grandmother complaining about how much pain she was in. Eventually, my mother learned how to put them in herself. My mother wanted my abuelita to stay in Chicago and live with us. Abuelita didn’t like the weather in Chicago. It was too hot in the summer and too cold in the winter. She thought our fair city was ¡una Chicagada! A rough translation of this word would be “Shitcago.” I couldn’t help myself and I laughed out loud. I’m sure my mother would have smacked me if abuelita wouldn’t have been so close to her.